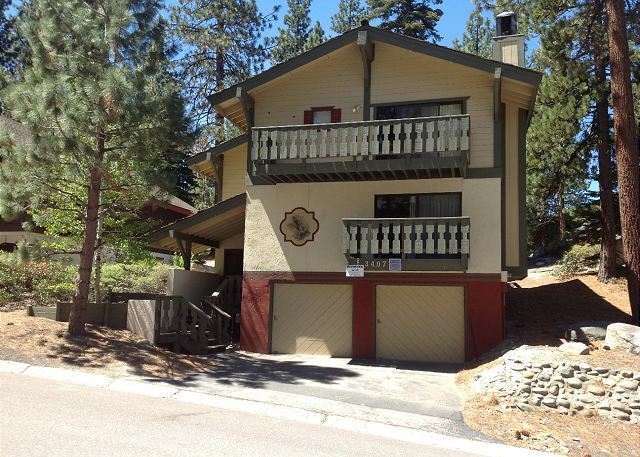 This 2 bedroom, 2 bath, 1568 square foot chalet sleeps up to 6. Remodeled within the last five years with a new range and microwave, granite countertops, sinks and faucets in the kitchen, plus bath vanities and countertops, hardwood flooring and new carpet throughout. Add all that to the great room, beamed ceilings, cozy furnishings and a convenient location, this is the place to be! There's a wood burning fireplace in the living room, plus a second fireplace in the master bedroom. The spacious sunny back deck has seasonal wrought iron patio furniture with umbrella, a gas BBQ, plus the bonus of filtered lake views. The oversized master bedroom has a king bed, wood burning fireplace, and a cable TV. The second bedroom has a queen bed and futon. Parking for 2 cars in the garage and 2 in the driveway. In-unit amenities include cable TV, VCR, DVD player and small stereo unit form the entertainment system. A stack washer/dryer is in the hall closet. There is a foosball table and three mini games, pool, table tennis and air hockey in the game room off the garage. There is also WIFI. This Internet service is a free benefit to our guests. There will be no refund of rent due to Internet outages or inability to connect. The private community of Tahoe Tyrol is located near the South Shore of Lake Tahoe. Our community of Tyrolean chalet style homes is a few blocks below the tram at Heavenly Valley Ski Resort, one easy mile to the lake, and one mile to the South Shore Casino area. This is a year round community offering miles of scenic hiking and bike trails, beach and water activities, golf, fishing, boating and numerous ski resorts. Many fine restaurants and fun shopping are within 3 miles. Maximum occupancy 6 people. Parking for 4 cars. No street parking.